Instructions: . Measure. 1. Medium. 2. he Large Loads. 3. he Full Capacity. Shake it! Then, pour to desired line. Pour. Pour your desired amount into dispenser. For center agitator, top off with water. 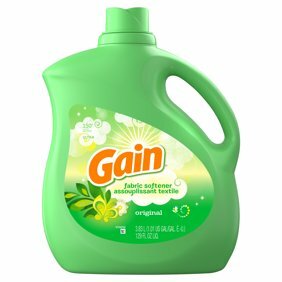 This Island Fresh scent of Gain Fabric Softener is the BOMB!! My clothes feel soft and smell great even days after washing them. I've been doing my own laundry since I was a teen. (Actually prefer it). Years in the Navy let me appreciate the scent of the ocean and coastal air. This is by far the nicest scent in your inventory. I only wish you had the scent booster to go along with it. We're so glad you love the scent of our Island Fresh fabric conditioner. We'll let the team know that you'd like to see a scent booster in the same scent. In the meantime, we suggest adding our Island Fresh dryer sheets to your regimen. You'll get the fresh-tastic freshness and softness you deserve! Love this stuff! Makes the clothes smell wonderful and it really lasts too. I love the smell of Gain island fresh products. All of their products work great and smell even better. It's all I use for my family. I absolutely love this scent! It is the only Gain scent that I will buy. I do not like the rest of the scents. Unlike the previous review, this scent last in my clothes for weeks. 1. We suggest giving our Tropical Sunrise Fireworks a try along with your Island fresh detergent.